Emily recalled that many of her fondest memories of Lexington and her years as a student at the University of Kentucky involved attending the races at Keeneland. For that reason, she wanted Keeneland to be part of her big day. The grounds are beautiful and I knew it would be the perfect setting for our winter wedding. 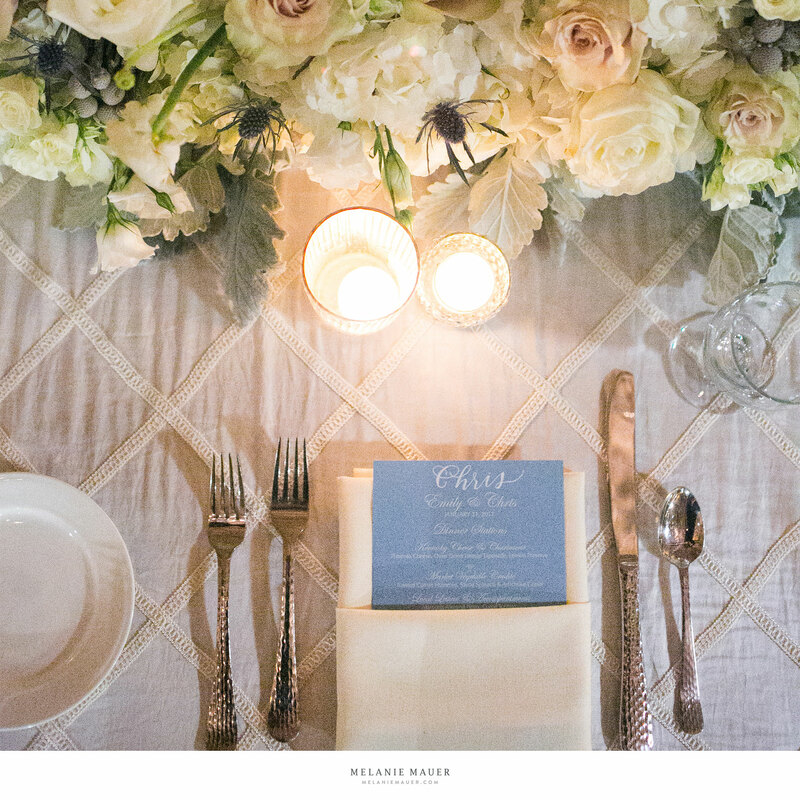 The couple wanted a menu that featured Kentucky fare presented using dinner stations. Hors d’oeuvres included Kentucky Hot Browns, white corn and crab fritters and endive spears with brie and local honey. "We wanted it to mimic the back of my dress. I think that was Chris’ favorite part of wedding planning!" Did you have a favorite flower that needed to make its way into your bouquet? "I had an amazing matron of honor, planner and designer, Melody Rodgers of Refined Social Events, who showed me a few pictures to gather ideas about what I wanted and she ran with it!" "If I have to choose one thing, it would be the bar. It created a stunning focal point when you walked into the room. The flowers on top were absolutely beautiful!" "I went to UK and going to the Spring and Fall meets were some of my greatest memories while living in Lexington. 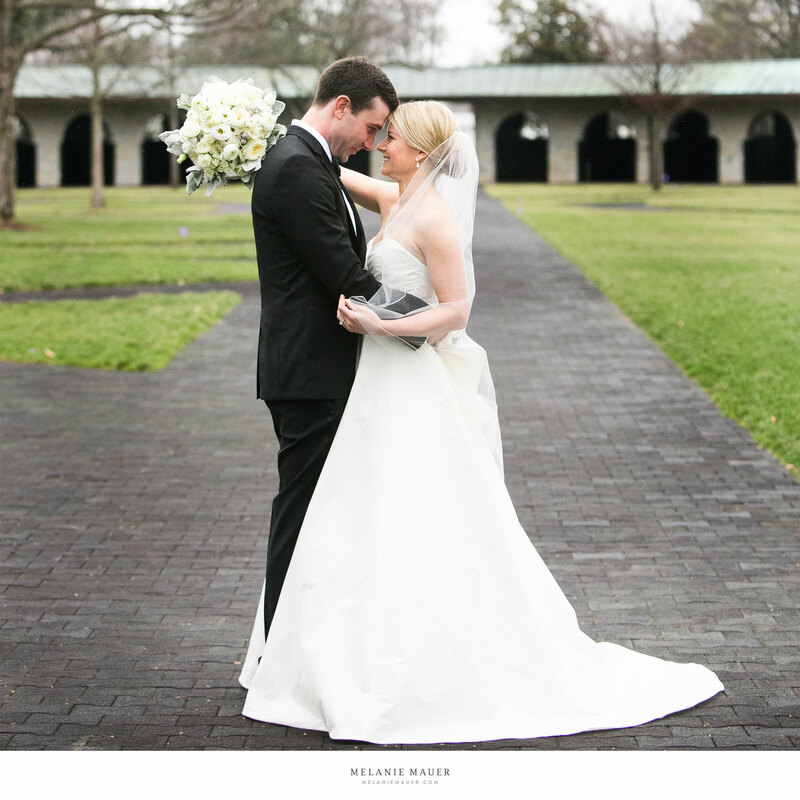 The grounds are beautiful and knew it would be the perfect setting for our winter wedding." Did you know right away they were your perfect match? "You always think you'll meet your husband through the traditional way of through family/friends or while you're in a social setting. However, times have changed and that doesn't happen as often. I always laugh when someone ask where we met because I own it and proud to say we met online. Chris on the other hand, would just say "out" then he would look at me and smile knowing I was about to tell the truth. As I tell my single friends in their mid-30s, "I give online dating hope!" The first time I met Chris, I knew he was "the one!". I sent my matrons of honor, Cortney and Melody, a text on our first date that I think this may be it. Fast forward 11 months later, we were engaged."